Churchill Downs Incorporated and Brown-Forman Corporation today announced a five-year agreement through which Brown-Forman’s Woodford Reserve bourbon will be the presenting sponsor of the Kentucky Derby. Beginning with its 144th running on Saturday, May 5, 2018 at Churchill Downs Racetrack (“Churchill Downs”) in Louisville, Ky., the $2 million classic race for 3-year-old Thoroughbreds and one of America’s premier sports and entertainment events will be known as the Kentucky Derby Presented by Woodford Reserve. America’s oldest continuously-held sports event with a history that dates to 1875, the Kentucky Derby will be nationally televised by NBC Sports. Terms of the presenting sponsor agreement between Churchill Downs and Brown-Forman were not released. The Kentucky Derby presenting partnership strengthens long-standing ties between a pair of institutions with strong international brands and deep roots in their home city. The corporate headquarters of both CDI and Brown-Forman are located in Louisville and their respective histories share similar historic timelines as each was founded in Louisville only a few years apart. Brown-Forman traces its history in the city to its founding in 1870, while the first Kentucky Derby was the highlight of the inaugural racing meet in 1875 at the Louisville Jockey Club, the racetrack that later became known as Churchill Downs. Brown-Forman grew and expanded from its Kentucky roots to rank as one of the largest American-owned spirits and wine companies. A top 10 global spirits company, Brown-Forman sells its brands in more than 165 countries and is the global leader in American whiskey. Woodford Reserve’s home is in the heart of Thoroughbred country at the historic Woodford Reserve Distillery in Versailles, Ky. The business relationship between Brown-Forman and Churchill Downs has a history of more than three decades and has included several partnerships. 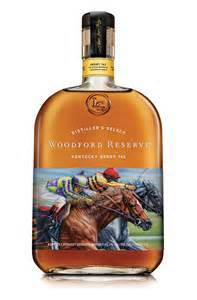 Woodford Reserve has been the “Official Bourbon of the Kentucky Derby” since 1999 and also becomes the presenting sponsor of the Road to the Kentucky Derby, the points series of 35 designated prep races that determines the participants in the maximum field of 20 horses that will compete in each year’s race. In announcing Brown-Forman’s new role as the presenting sponsor of the Kentucky Derby, Carstanjen thanked CDI’s outgoing Kentucky Derby presenting sponsor for its partnership efforts. “The creation of a presenting sponsor was an important step in the ongoing growth of the Kentucky Derby, and we deeply appreciate the support of Yum! Brands for more than a decade in that groundbreaking role,” Carstanjen said.